Stewart, whose console was directly connected to a DiGiCo SoundGrid server, used the Waves Dialog Noise Suppression plugin to reduce the room regeneration coming back in to the microphones and also made use of the Waves C6 Multiband Compressor. Tom Pesa, the A-stage monitor engineer, and Michael Parker, monitor engineer for the B stage, each mixed on an SD7 with a redundant engine. This year, for the first time, an SD8-24—supplied by Hi-Tech Audio for the occasion—was positioned backstage at A2 world, and that enabled an assistant engineer to more efficiently monitor signal distribution throughout the venue. 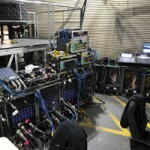 As in previous years, Parker and Pesa each accessed common head amps in the four SD-Racks positioned backstage. But this year, in another first, two SD-Racks were added in parallel in order to provide Reaves with discrete preamp control at FOH. “Those were running MADI to his console. Staying at 48 kHz, we got an entire rack down one MADI cable instead of two,” says Jeff Peterson, ATK’s system designer. A further four SD-Racks were dedicated to outputs. 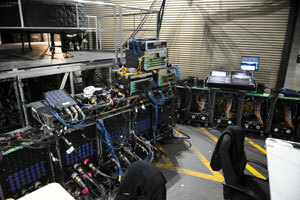 ATK’s recent purchase was comprised of six consoles—two SD10s, two SD7s and two SD5s—plus 14 SD-Racks. JBL VerTec line arrays comprised the live sound reinforcement system at the Staples Center. ATK Audiotek provided the main P.A. system for the Awards ceremony, which featured four arrays each containing 12 VerTec VT4889 full-size line array elements, plus two arrays of six VT4880A full-size arrayable subwoofers each. An additional 12 VRX932 Constant Curvature loudspeakers were used for front fill. The Staples Center also features a permanent JBL VerTec line array system, which ATK Audiotek also used. The Staples Center system features eight arrays each containing between 11 and 13 JBL VT4889DP-DA powered line array elements, plus two fill clusters each containing four VT4889DP-DA elements, which are specially positioned to cover the end seating areas. The system also features four subwoofer arrays, each containing six VT4880A full-size arrayable subwoofers.